Vonage wanted to change its business strategy to refocus on the right kind of customer, SMEs rather than home-based businesses. The brief was a simple but challenging one; we had to grow awareness quickly in order to make the right people understand, consider and buy Vonage’s multi-line product for their small business. Our challenge was to make the owners of these diverse businesses aware of an organisation they’d barely heard of, which offered a fairly complex telephony service, in a moment when telecoms spend is in decline and mobile technology is ever more prevalent. Creating a connection quickly was vital. Our overarching strategy with Vonage is focused on making Vonage ‘the expert in the small business conversation. This ambition provided our starting point. Research told us that, for SME owners, their business is their life as well as their livelihood.They’re all about finding ways to make their business as successful as possible and don’t have time to make the wrong decisions or waste time doing things that take them away from their main business focus – like shopping around for new phone solutions. 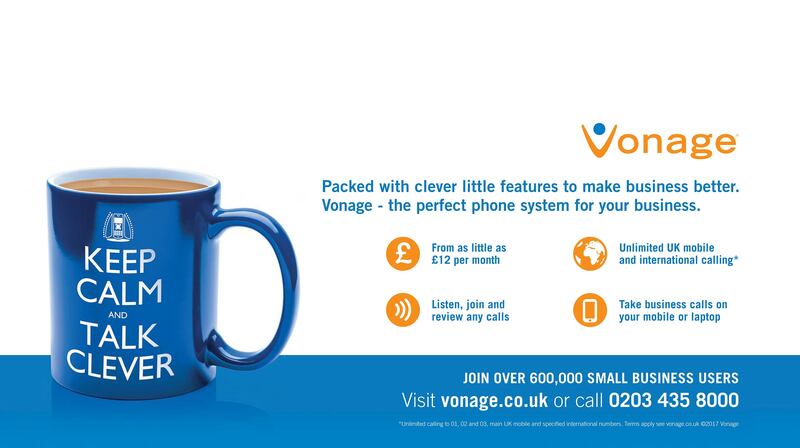 Vonage have a set of product features that really can save small businesses time and money, and make them work more effectively. However these are all rational considerations that take time to understand. In addition, the features themselves are complicated, however their combined effect is actually to make life easier for their users. In a market dominated by jargon, complexity, tariffs and multiple options; we had to resonate with these decision makers and deliver our features and benefits as simply and succinctly as possible. Core to our strategy was to make connection, ‘de-mystifying’ the product which would encourage people to discover the Vonage benefit. This in turn would ensure people understand, consider and buy Vonage’s multi-line product for their small business. To create an emotional hook we harnessed a national treasure- the ‘Keep Calm and Carry On’ slogan. It typified the benefit that Vonage could make, and with a small tweak, became the core of our idea; ‘Keep Calm and Talk Clever’. This was quickly combined with our most impressive features and compelling price points. The story was told differently in different channels, but always tied back to the core ‘calming’ idea. Tube panels were a core asset and allowed us to create our own ‘Keep Calm’ iconography and explain the real benefits of the features. In radio, we demonstrated ‘calmness’ in a different way. Setting the scene of a stressed business owner on an archetypal psychiatrists couch, the only remedy for his business challenges was Vonage. The campaign helped Vonage deliver one of their most successful sales periods, well above previous years. The campaign drove a significant uplift in awareness, peaking at 12% in all SMEs (a 30% increase on pre-campaign levels), but reached as high as 17% in our most valuable 20-50 employee sized target organizations. Consideration levels doubled from the pre-campaign measurement (from 2% to 4% or a 200% increase). Amongst the core competitor set, awareness and consideration metrics were the highest, in fact 4 times higher than our main rival. The quality of awareness is significant too, again, leading the field in understanding and knowledge. The campaign has proven to be the most effective yet, with significant gains in attribution against the October 2016 activity, quadrupling attribution metrics, in all channels- proving significant brand growth. Recall and attribution was also proven to significantly outperform the market leader’s heavy spending campaign.